in hospital #8 of rubeola. 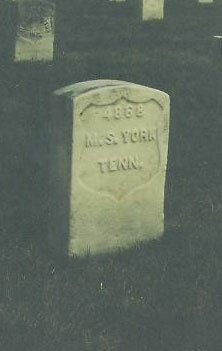 Marion York married Mary Ann Perry Lentz December 12, 1854 in Limetone Co., AL. Mary Ann was a cousin to Abraham J. Lentz who was also in Co. K of this regiment. Marion had three brothers who fought for the Confederacy, Andrew Jackson York, Charles Franklin York and Presley Polk York.